The Myrtle Beach area – then known as Long Bay – was inhabited by the Waccamaw Indians before the Europeans arrived in the late 18th century. In 1899, Burroughs and Collins received a charter to build the Conway & Seashore Railroad, which began service in 1900. Railroad workers spent their downtime at the beach, becoming the area’s first tourists. The beach area was then called “New Town” in contrast to the “Old Town” of Conway. In 1900, a contest was held to rename the town. In homage to the wax myrtle bushes that are so prominent here, Addie Burroughs, widow of Franklin G. Burroughs, offered the name Myrtle Beach. The name stuck, and Myrtle Beach became an official town in 1938. It became a city in 1957. The town grew gradually from a farming community into a beach destination. John T. Woodside’s construction of a golf course and the grand Ocean Forest Hotel were instrumental in developing the area’s tourism culture. The Ocean Forest Hotel was built in 1930 and covered 13 acres of oceanfront land, offering the first upscale accommodations in the Myrtle Beach area. 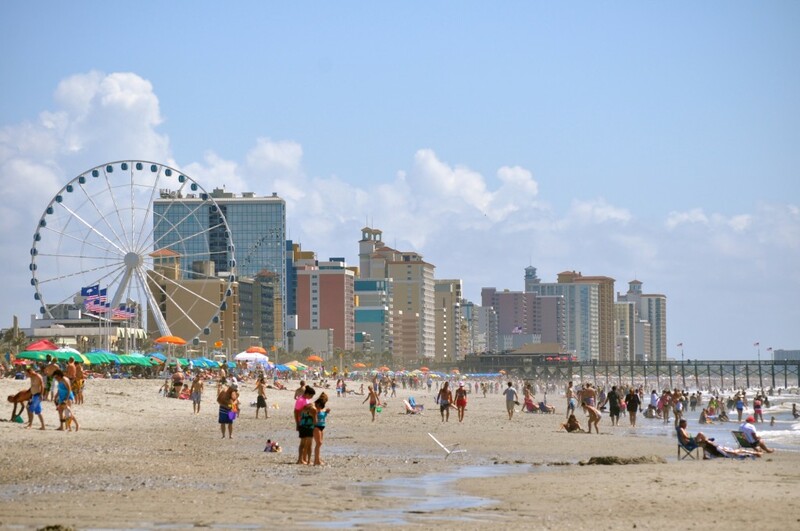 From one hotel to hundreds of accommodations choices today, the Myrtle Beach area remains a tourist destination, attracting more than 14 million visitors each year. 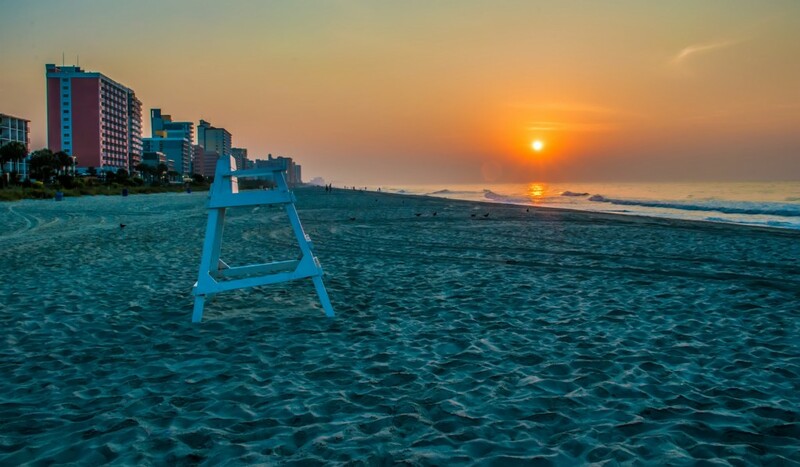 Myrtle Beach and its surrounding areas include over 60 miles of sandy white beaches – also known as the Grand Strand. Visitors have a number of options when selecting where to stay on their vacation. They include the South Strand, central Myrtle Beach and the North Strand. Check out our descriptions of each to find the perfect spot for you and your group. If you’re looking to relocate, check out our relocation guide for in-depth information on Myrtle Beach-area communities. Myrtle Beach | Myrtle Beach is the heart of it all and centrally located on the Grand Strand. Broadway at the Beach, Family Kingdom, the oceanfront boardwalk and The Market Common are just a few of the exciting places you’ll see in Myrtle Beach. Take your pick from high-rise hotels, mom and pop motels, oceanfront condos or beach home rentals for your next vacation. North Myrtle Beach | North Myrtle Beach is popular vacation destination for golfers, couples, families and more and is home to Barefoot Landing, the Alabama Theatre, the OD Pavilion and many other hot spots. Atlantic Beach, Crescent Beach, Cherry Grove and Little River are also included in the North Strand area. Oceanfront hotels, condos and vacation homes are scattered throughout the North end. South Strand | The South Strand includes Surfside Beach, Garden City Beach and Murrells Inlet. The area is home to dozens of beach homes and private condos as well as several smaller hotels. Surfside Beach is known as “the family beach” and offers water parks, a pier and miles of beaches. Visit the Murrells Inlet Marshwalk for the freshest seafood and live entertainment. Litchfield and Pawleys Island | At the south end of the Grand Strand are Litchfield and Pawleys Island. The quiet spots offer private communities and a plethora of local establishments as well as some of the most exclusive golf courses.